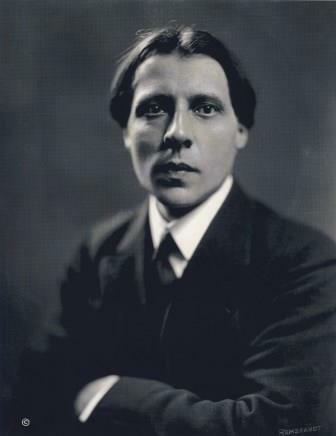 Alfred Cortot was born on September 26, 1877 in Nyon, Switzerland. He started learning piano at the age of five, along with his two sisters. In 1886, the Cortot family moved to Paris with the goal of having Alfred study at the Conservatoire National Supérieur de Musique et de Danse. At the time, his training and musicianship weren’t adequate and he was ultimately rejected. However, one of the Conservatory’s professors, Émile Decombes accepted him in his course as an observer. One year later, Alfred tried yet again to pass the entrance exam and, this time, succeeded. There, he had the chance to meet the students studying under Frédéric Chopin, which made a life-long impression upon him. In 1896, just shy of 19 years old, he played a brilliant rendition of the Quatrième Ballade de Chopin in front of a jury of the school’s faculty, who unanimously and named him, and only him, the winner. The discovery of Wagner’s music during a trip to Beyrouth was such a shock that he decided to become a conductor upon his return to France. He convinced the Countess Greffulhe to finance the first execution of Crépuscule des Dieux in France, which he triumphantly led by himself on April 15th, 1902. In 1903 he created his own orchestra, which allowed him to conduct some of the first interpretations of Brahms’s Requiem Allemand and Beethoven’s Missa Solemnis in France. However, for financial reasons he had to return to a career as a pianist in 1905. In 1905, he founded, a chamber music trio, with Pablo Casals and Jacques Thibaud,. Before long, they had an international reputation. 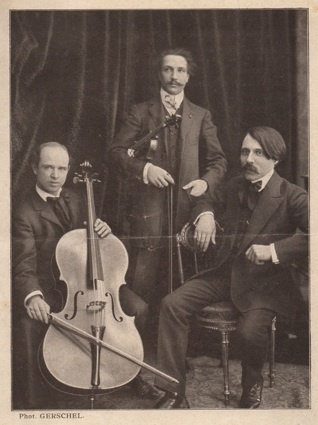 The trio was a considerable success that succeeded in transitioning this genre of music, that had traditionally been listened to in parlors, to the concert stage. Apart from his activity as an interpreter, Alfred Cortot pursued a career as a teacher. He was nominated as professor of the women’s piano program at the Conservatoire de Paris in 1907. Some of his very first students were Yvonne Lefébure, Magda Tagliaferro and Clara Haskil. 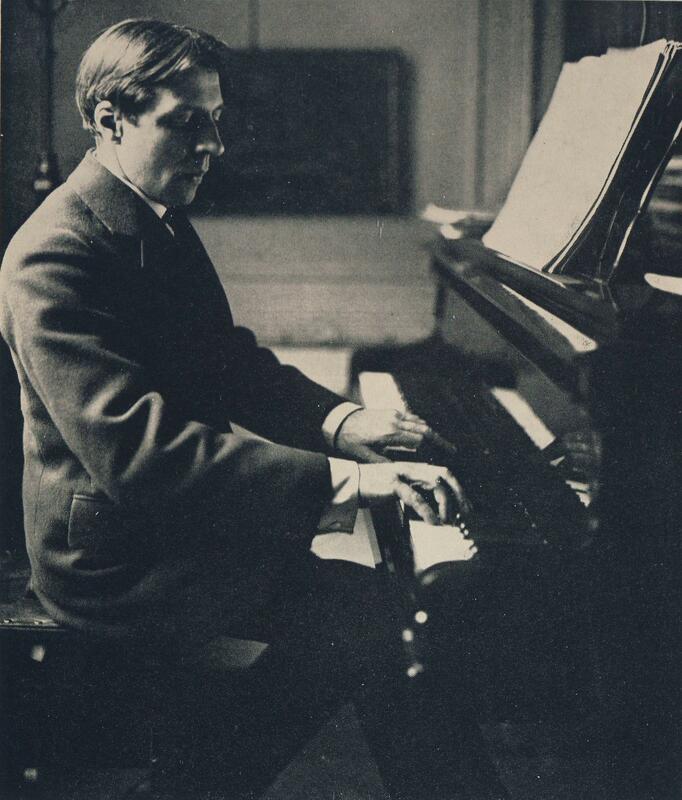 For the rest of his life, Cortot alternated between performance and teaching. The period between the two world wars was the height of Cortot’s artistic career. It’s during this period that he composed the majority of his works: educational texts (Méthodes de Piano, Éditions Commentées), and literary works (La Musique Française de Piano, Préfaces, etc.). His book La Musique Francaise de Piano is a collection of articles on the piano works of Franck, Debussy, Ravel and the Groupe des Six. Cortot was particularly enchanted by the French music of his time. Cortot soon became one of the most renowned musicians in the world. The country where he started his career, Germany, also happened to be the one where he had the most success. By the end of the 1920’s, the Germans considered him as « the greatest pianist of his time » and « the most gifted translator of Schumann ». After a tour of the United States in 1918, he founded l ‘École Normale de Musique de Paris alongside Auguste Mangeot, the director of the review Le Monde Musical. Foundation of the École Normale de Musique de Paris on October 6th by Alfred Cortot and Auguste Mangeot as a private institution. The objectives consist of maintaining the cultural prestige of France and cultivating great teachers and virtuosos thanks to a holistic pedagogy featuring extensive study of an instrument, music theory, writing, history of music, practice and teaching. Alfred Cortot defined this teaching style as one that « omits nothing… it is the result of the intersection of the diverse branches of general teaching and varied specialization ». 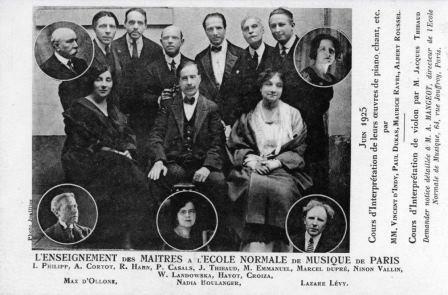 Cortot acquired some of the best teachers of the era, which was partly made up of former students such as pianists Yvonne Lefébure and Nadia Boulanger, organist Marcel Dupré, harpsichordist Wanda Landowska, violinist Jacques Thibaud, cellists Pablo Casals and André Navarra, vocalists Claire Croiza, Charles Panzéra and Pierre Bernac and composers Georges Eneso, Paul Dukas and Arthur Honegger. The school moved to 114bis, boulevard Malesherbes, in a private mansion given by the Marquis of Maleissye. The Salle Cortot, the concert hall of the School and place of expression for students, had its inauguration in June. The death of Alfred Cortot. Having presided over the school for 43 years, he was succeeded by composer Pierre Petit in the capacity of Director. Later, in 1964, the orchestra conductor Charles Munch became president. The composer Henri Dutilleux was named President of the School, a position he held until 1974. Restoration of the Salle Cortot thanks to support from the Minister of Culture and Mrs. Liliane Bettencourt.